We were thrilled when Sonara gave us another beautiful daughter in 2009, with white "boots"...she was instantly "WONDER WOMAN" ! Wonder has been a superstar from day one ! She is truly "AWESOME"!! She has Reserve Grand @ only 4 months old, has had numerous first place wins and was 14th in her Senior Yearling class at the June 2010 ADGA National show. She had a capacious and productive udder as a first freshener in 2011 and she got a restricted Championship milking leg in 2012 while in extended lactation (19 months since freshening !). She also appraised an amazing 90 !! !..again in an extended FIRST lactation. 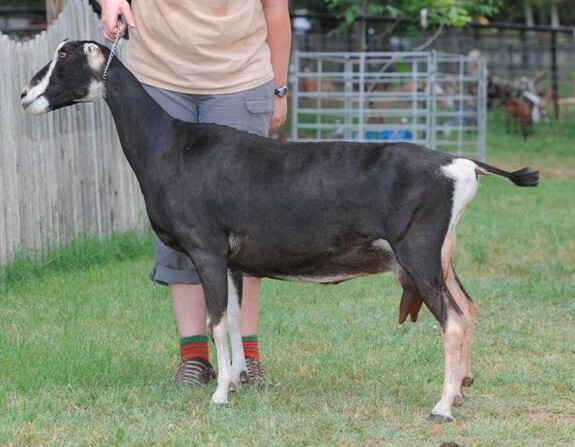 She has an amazing 8 Reserve Championship wins, generally placing right behind one of her Latte Da 'sisters'. 2014 will be her year as she is moving to the top of our show string ! 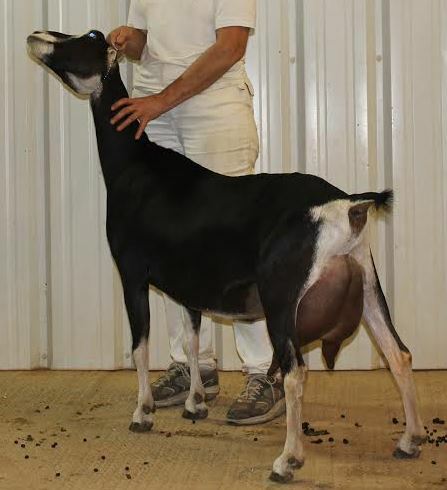 Finally, in typical Wonder "style", she finished her GCH by going BEST DOE and BEST UDDER IN SHOW @ the 2014 FW Stock Show. The BEST UDDER honor runs in the family as her 1/2 sister, Bonnie, was BEST UDDER in 2013 and her mother, Sonara, did the same in 2009. She was bred to PayDay...producing our very last PayDay kid in 2013. Her daughters Mary and DawnStar are also in our herd, to carry on the family tradition !